The appsetting JSON file contains the LocalDB connection string details in our Application and we have given the database name as "UserDb". 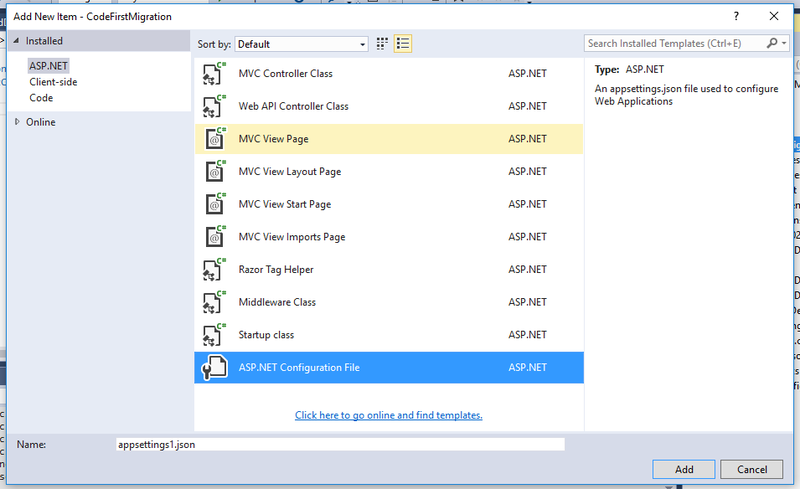 If you want to know more about JSON file configuration in ASP.NET Core, please check our previous article ASP.NET Core 1.0: Adding A Configuration Source File. The code given below contains the information about EntityFrameWork Core DbContext. We can add the LocalDB connection string details with the help of "UseSqlServer" Method. We are going to implement Code First Migrations in Entity Framework Core to seed the database with test data and manually we are entering the seed data information in the "CodeDbSeedData" class. The code given below contains the default values of User Details Table in our Application. The class given below contains the complete middleware details in our Applications. The command given below will help to change our current "C Drive" to "F Drive" because currently our Code First Migration project is saved into "F Drive". 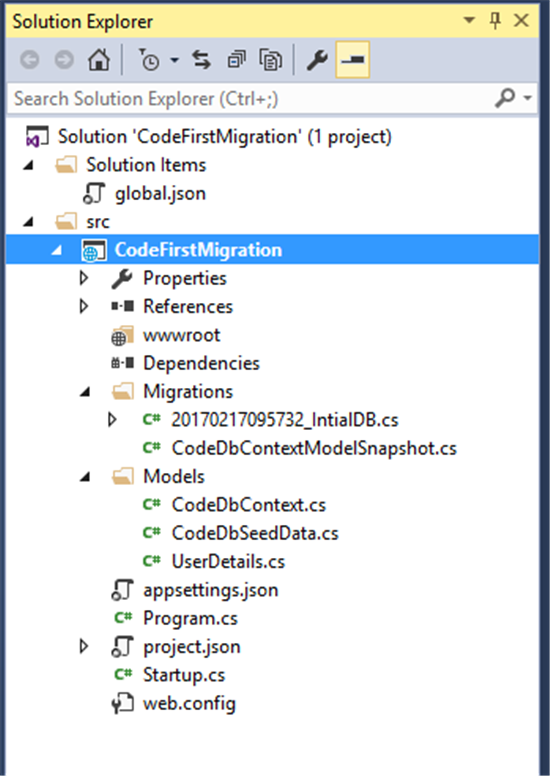 "dotnet ef migrations add IntialDB"
The Dotnet EntityFrameWork CLI ( Command Line Interface ) creates the Local DB as "UserDB". 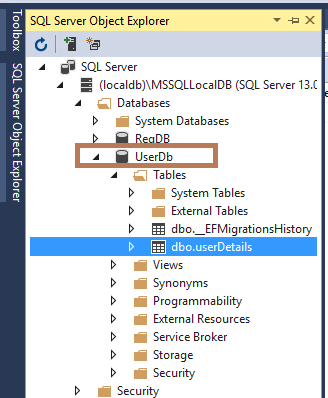 Go to "View" and select "SQL Server Object Explorer" in Visual Studio. 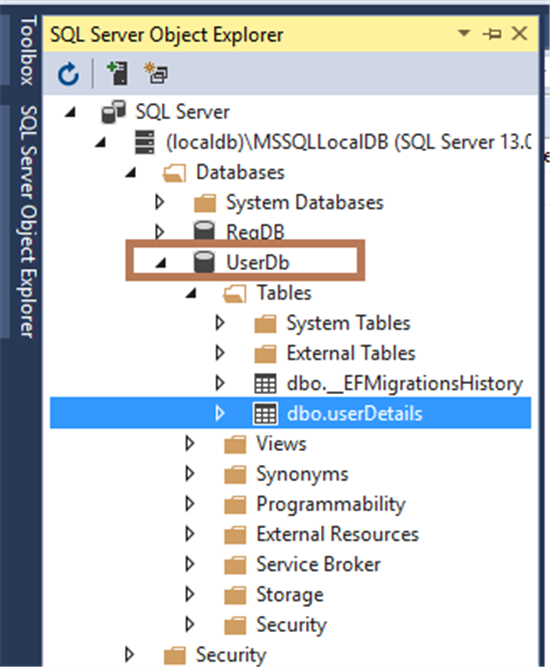 Now, expand "SQL Server -> (localdb) -> Databases -> UserDB". You can download other ASP.NET Core 1.0 source code from the MSDN Code, using the links, mentioned below. It's recommended to read more articles related to ASP.NET Core.